MINNEAPOLIS — The Cleveland Indians have turned this division race into a late-summer cruise, with the Minnesota Twins already in future-planning mode. Carlos Carrasco struck out 10 while taking a shutout into the eighth inning, winning his fourth straight start since returning from the disabled list to carry the Indians to a 2-0 victory over the Twins on Wednesday. 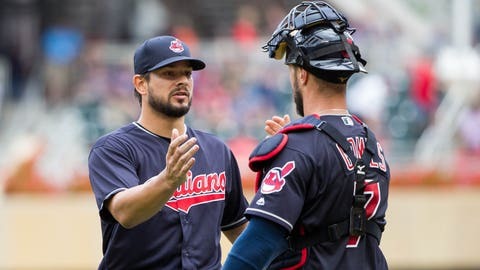 Brad Hand recorded the last five outs for his second save in as many attempts with the Indians, who stretched their lead over the Twins in the AL Central to 10 games and improved to 32-15 in intra-division games this season. After the Indians acquired Hand and fellow reliever Adam Cimber from San Diego during the All-Star break, the Twins front office formally surrendered 2018 by trading five regulars in separate trades that fetched 12 players and only one current major leaguer. Carrasco (13-5), who missed three weeks with a bruised elbow before his reinstatement on July 6, has 63 strikeouts in his last eight starts. This was his fourth turn with double-digit strikeouts, and he won his fifth straight decision. Carrasco picked up a victory with one inning of relief on July 15, right before the All-Star break. The Indians, who won a series against the Twins for the first time in four tries this year, have allowed only 13 runs over their last six games. Their ERA against AL Central teams is 2.70 this season, the best intra-division mark in MLB. The Indians also led the major leagues in July in runs, steals and batting average. The bullpen that has been their biggest concern? Over the past nine games, Indians relievers have a collective 1.08 ERA. Hand, the two-time All-Star and Minnesota native, had 24 saves in 29 opportunities with the Padres. Jorge Polanco, who had two of Minnesota’s five hits, singled in the fourth after Carrasco retired the first 11 batters. Joe Mauer hit his first triple of the year after an eight-pitch, two-out at-bat in the sixth, but Carrasco struck out the side. “It’s pretty scary if you’ve got a guy like that,” shortstop Francisco Lindor said. Adalberto Mejia gave the Twins five scoreless innings to start with only one hit allowed, but reliever Matt Magill allowed a run in the sixth when Rajai Davis came home during catcher Mitch Garver’s throw to second base to catch Jose Ramirez stealing. Davis, who was not credited with a stolen base, started the rally with a single. The Twins directed Garver to throw rather than hold the ball. “I wasn’t going to give him a free base,” manager Paul Molitor said. Leonys Martin, who was acquired to bolster the injury-depleted outfield in an intra-division trade with the Detroit Tigers to beat the deadline on Tuesday, made his Cleveland debut as a pinch-hitter in the sixth inning and singled in the ninth. Greg Allen, who had three runs and three hits on Tuesday, was sent back to Triple-A Columbus after two games. Logan Forsythe, who came to Minnesota with two minor league players from the Dodgers in the trade for Brian Dozier, made his first appearance for the Twins by sharply grounding into a double play as a pinch-hitter in the eighth. Lindor made a slick scoop and pivot to start the play. After boarding a red-eye flight from Los Angeles, Forsythe was at the ballpark for the matinee with minimal rest. Miller could rejoin the bullpen on Friday, Francona said, or he might be asked to stay on his rehab assignment and pitch more than one inning. Miller has been out for more than two months with right knee trouble. Indians: There’s no game scheduled on Thursday, before the team returns home to host Los Angeles in a three-game series. RHP Mike Clevinger (7-7, 3.43 ERA) starts for the Indians, and RHP Jaime Barria (6-7, 3.74 ERA) pitches for the Angels. Twins: Following a day off, RHP Jake Odorizzi (4-7, 4.58 ERA) takes the mound on Friday night to start a three-game series against Kansas City. RHP Heath Fillmyer (0-1, 3.29 ERA) pitches for the Royals.